First Time? What to Expect ? Welcome to the world of table tennis and congratulations on taking the steps to move up to the Olympic athletic sport of table tennis from the recreational basement game of ping-pong. However, it’s important to keep certain simple facts in mind before choosing to move up to the sport of table tennis as a serious club player. It happens almost every night in America: a ping-pong hacker who has beaten every other hacker in the neighborhood or bar (usually having mastered a pet trick serve or a bizarre stroke using a cheap illegal racket), walks into a serious table tennis club with grandiose fantasies of beating the top player in the club. When the session is over they leave the club in utter disbelief after being annihilated–often by the lowliest player in the club or a 10-year old child–never to return, ever. This is sad because it doesn’t mean the new “hacker” is not athletic or talented enough to become a decent table tennis player. One really does not have to have the lightning reflexes or athletic talent of an Olympic table tennis player to become an expert or even a master table tennis player. It is just that it’s not going to happen in a day or a week or even a few months! Most “ping-pong” hackers delude themselves (because basement ping-pong seems so ridiculously easy to play) when they come to a club for the first time (or even first few 100 times) and expect to compete at an even level with experienced competitive players. The spin of the ball is quite complex relative to any other sport even at VERY LOW skill levels of table tennis. The spin is generated at significantly higher ball travel speeds relative to other sports. Both spin and speed are generated over a relatively small area relative to other sports, thus demanding a far higher degree of consistent and continuous precision, accuracy. and concentration. Both spin and speed are generated by high technology rackets. Every player has a unique style. Table tennis is an extremely racket-sensitive sport and dependent not only on your own playing style but your opponent’s as well. Even many advanced players, let alone newcomers, have absolutely no clue whatsoever about the complexity of modern rackets. 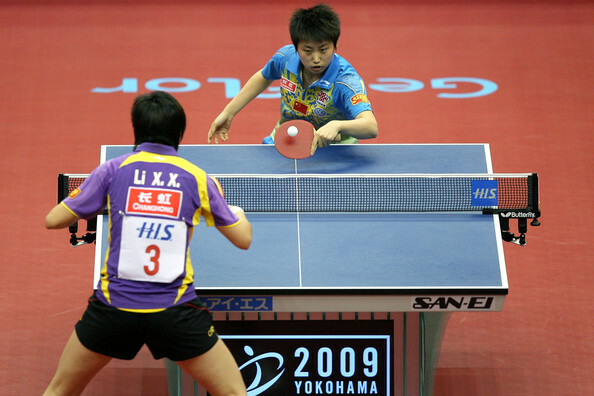 Table tennis is a sport of a billion unique individual styles (due to infinite combinations of standard and unorthodox grips, stroke execution mechanics and racket designs). Though it is often incorrectly oversimplified down to a few basic styles, grips and rackets, every player needs to find a racket that exactly matches his/her playing style. In most cases this may take years to determine, as minute mechanical changes or even minute chemical changes (as you will learn about this controversial issue later if you stick around) to your (and your opponent’s) overall racket design can greatly effect your performance at any given equal skill level. All this information is given here not to scare you into giving up or not even trying. The point here is: if you think you are going to become a decent “table tennis” player in a week or even few months, it’s just not going to happen. 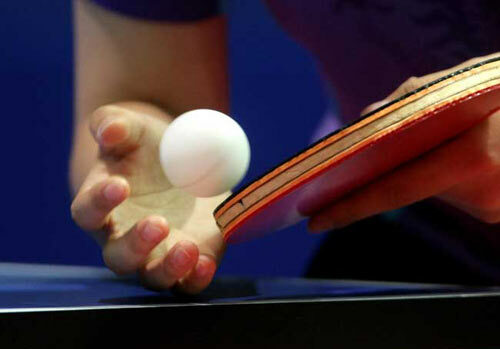 Even if you are a world-class athlete and were born to be a table tennis talent, it’s still likely to take at least six months to even become an intermediate table tennis player, let alone an advanced, expert or master player. Table tennis skills and equipment (rubbers and rackets) are much more complex than the recreational meanderings of basement ping-pong. But more important, it’s downright insulting (and laughable) to a club player for a new basement hacker to think that (s)he can just walk into a club and beat everyone and anyone with a trick serve and an illegal 99 cent racket. (The club player has invested not only lots of money in equipment and coaching but also lots of time to develop the skills and endured lots of sometimes humiliating “abuse” from advanced players when they to started as ping-pong hackers themselves). Be prepared to pay your dues first to move up just as in any job or career. Therefore the good news is that it’s possible to become a decent–if not an advanced table tennis player–and enjoy a lifetime sport as a fun exercise tool IF you apply yourself methodically to understanding it as a sport and not just an easy basement game. If you plan on even moving up to table tennis from ping-pong, let alone becoming an advanced player, be prepared to invest the time and money to thoroughly understand and master the intricacies of table tennis strokes, game tactics and strategies, AND the equipment (rackets). The racket design (both yours and your opponent’s) is usually greatly ignored by beginners and often ignored even by advanced players! If you have the temperament to handle the constant beatings day after day for months (or years!) but are willing to work on improving your skills instead of letting your ego get in the way (as is quite common in any individual sport) you can become a true table tennis competitor. As you lose over and over to every conceivable style of play you are learning from your beatings. Keep in mind that even a low level club player has more consistency, more touch and better rackets compared to most newcomers. This is no different than the difference between professional players and amateurs in any sport. There is no reason to quit coming to our club after just few days or weeks or even few months. Most serious club table tennis players understand how complex table tennis is and don’t think of you as any less of an athlete or a person even if you keep losing to most other club players for years to come. Most are more than willing to help you nonetheless, in every way possible to improve your skill level, regardless of whether you are an absolute beginner or even an advanced player. Even if you are not interested in spending lots of money on equipment, you can get a good “basic” setup for less than $100 that can last for years. Or, many experienced players will have rackets they no longer use that they will let you try out and then if you like it will sell it to you for much less than the cost of a new racket and new rubbers. Again, this information is not meant to scare you away but rather to help you to graduate to table tennis from ping-pong as quickly as possible. Once you start to understand and handle the spin and speed of your opponents–and start generating such spin and speed on your own–you will get hopelessly fascinated and addicted to the sport forever!